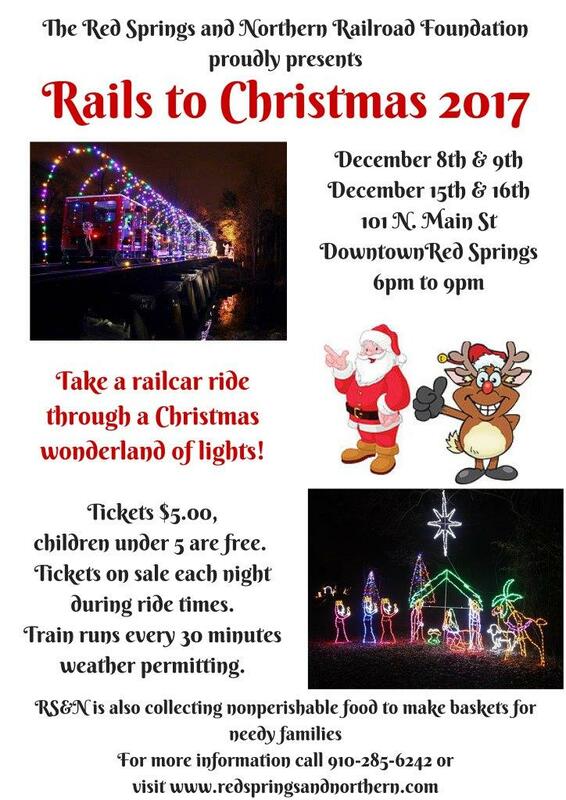 Its almost time for our annual Rails to Christmas train rides!!!!!!! We invite you to take a little ride through our Christmas wonderland of decorations,lights,displays and maybe even a hardy Ho-Ho-Ho from the big guy Santa Claus himself! The dates for our rides will be Friday and Saturday Dec. 8th and 9th and Friday and Saturday Dec. 15th and 16th. Ride times are 6 pm-9 pm weather permitting and each ride will last about 25-30 minutes. Ticket prices are $5.00 per person and children under 5 ride for free. Our boarding location and depot are located in Red Springs at the corners of N.Main St. and 3rd Ave. where the railroad tracks cross the road. We are asking everyone to please bring a non perishable food item to donate as we will be adopting several families in Robeson County to make sure they have a Merry Christmas.We have done this for several years now and it does make a difference,a big difference in some cases. So come on out and help us celebrate the Christmas Holidays, we are looking forward to seeing you! Please call 910-285-6242 or 910-617-1213, please be sure to leave a message.